Jackson Pollock is the American painter most associated with Gestural Abstraction and the New York School at the mid century mark. We need to be careful and not overlook the contributions Peggy Guggenheim and Lee Krasner made to this experimental art movement emanating from Greenwich Village. Krasner stated: “Painting… in which the inner and the outer man are inseparable, transcends technique, transcends subject and moves into the realm of the inevitable.” How would you interpret this statement by Krasner and do you believe it offers insight into the work of Pollock, Krasner and the other gestural abstractionists? I always found Lee Krasner’s work to be fascinating. Pollock’s shadow is a daunting thing to overcome. We tend to view these artists as isolated geniuses, but their work has outside influences. It also takes a lot of work to get there, but we somehow feel like success should happen instantly. Pollock was shaped by teachers, patrons, critics, and fellow experimental artists like his wife Lee Krasner. They helped him find and refine his voice, and gave him a platform to communicate those ideas to the world. Gestural abstraction was a radical departure from Western tradition and required new ways of discussing art. Once Pollock had his process figured out, he could enter that painting nirvana Lee Krasner was talking about. I see the first half of this statement as mostly or almost only applicable to the gestural abstractionists. She is suggesting that the work the results from this style of painting are reflective of a person who is connected with oneself. It seems to describe how the fluidity of the painting is tied to emotional choreography or “inner man” and carried out through the hand of the artist or “outer man”. This statement reflects the belief that all artists work inevitably transcends into more than it appears. I think it does offer insight. It offers a description of the possible process and inspiration to a piece. It allows some critics to see that this style is an expression from within and not simply the flinging of paint. I believe she refers to the act and technique of painting. 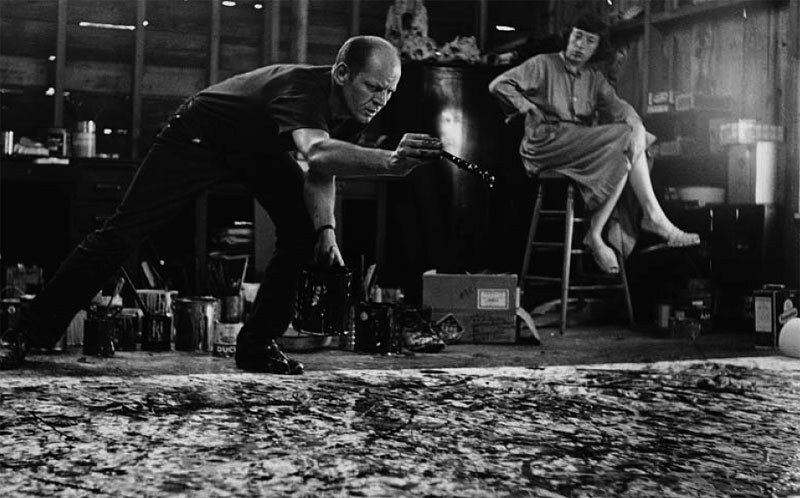 There is a lot of emotion and energy that goes into paintings especially the Gestural Abstraction that Pollock and she created. Lee Krasner has talked about the physical connection that painting connects her with and I believe in this statement she is talking more about the outside influences and what the artist is feeling within and how they are able to capture that by the paintings, every mark meant something different to her. I do believe that Krasner’s statement offers an insight into the work of gestural abstractionists. Such artists were working out from emotions to represent “reality.” Pollock, especially, conveyed this through his expressive imagery. Pollock has been caught saying, “I don’t paint nature. I am nature.” Therefore, what is inside of him, his emotions, is what makes nature and reality. That is what, I think, Krasner meant when she said, “…the inner and the outer man are inseparable…” The feelings we possess on the inner make us who we are on the outer. I think that this statement by Krasner identifies how gestural abstractionists get their ideas and motivation for their work. By not separating your inner and outer self, the painting becomes you and all that is real to you; the way you perceive the world. Just like when Pollock made the statement, “I am nature,” it’s the same concept: he IS his art. The statement by Krasner definitely offers insight into the work of the gestural abstractionist artists because they are doing just what she says, looking inward at themselves, even if that means being aggressive and confrontational. They are being genuine and true to themselves by expressing their feelings, thoughts, and emotions that make up who they are as people. I’m not sure Krasner’s statement applies to Pollock in particular, but I can see how it applies to artists who express themselves through abstract art. The quote tells that an artist’s expression isn’t guaranteed by the vehicle of medium or technique, but guaranteed by the person themselves (the inner and outer being). I think artists can arrive at creative notions not necessarily within their medium of choice, but just by being expressive and uninhibited in all avenues of life. First off the transcends is a very good point. It seems to show the fact that everything we are is basic and we just need to be that basic human to be as one with all. I feel that work that is made for other reasons does not fit and see why. Pollock was just Pollock and good painter paint who he is was stated by him. I fell this to be true. We need not white horses and consecrated ideas to make great art, also the rendering is out the window. It offers huge insight to Pollocks work but one must understand all of it first to get the points. Krasner had nice inside and being on the inside knew what this man was all about. All we have our writing of both to read. Seems to me that this is some of the most powerful American Art and was what put us goin in the game of art. 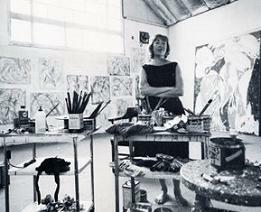 Lee Krasner is purely stating that the artist is part of the painting and the painting is part of the artist. They should be no different than one another, you show exactly what you are feeling in gestures of your abstract painting, every stroke portrays emotion. I agree with Patricia when she says that your painting shows exactly what you are feeling and thinking and that “every stroke portrays emotion.” I realize that happens when I paint and that is what Krasner is talking about. Your emotion and what you do are inseparable. And to be honest I believe that makes a more creative result in art. Krasner believed that when artists have the ability to paint in a dramatic manner with both the inner and outer man becoming inseparable. This is when the artist is able to paint with deep passion and strength to create works that transcend into meaning of it’s own, to no fault of the artist. This meant the artist will create a technique of painting where certain aspects of the compositon will become inevitable, and as a result cause the work to stand out in a realm without rules. I believe this statement is quite a relevant definition of what Abstract Expressionism is about. The inner and the outer self are indeed inseparable when it comes to a technique such as spontaneous gestural paintings of Pollock’s that showcase a depth of emotion and feeling of the artist. Krasner’s statement is definitely an insight on what Abstract Expressionism is about. The idea of using no imagery to convey emotions. Jackson Pollock is an inevitable person to think of when hearing this statement. This is because he was extremely antitechnique and antisubject. His work was a direct expression of what he was about. Pollock did not start a painting with any idea in mind but to let the paintings energy fuel itself and grow as a lifeform as its own. What Krasner meant was that the technique that Pollock transcended technique and subject, because there was so much information to portray that it would be impossible to use a subject or a straightforward technique. Pollock wanted to portray pure emotion, and he couldn’t have done that any other way but through gestural abstractionism. When Krasner talked about the inner and outer man, I think she meant that the outer man, the influenced man, and the inner man the person you essentially are, your responses to particular situation and your personality are all put into the canvas. It doesn’t matter what or how you paint because its a very pure form of expression. I believe that the statement is very well a hint into the process by which Pollack and many other abstract painters go into. To make a piece of work that can speak and relate to another person in a language that is foreign and not from the outside point of view understandable, is something that requires a special summoning. He or she must draw inspiration or go into a place which exceeds the limitations of your everyday conscientiousness. Luckily Peggy and Lee understood that, and admired it so much that they gave a fortune for this type of art to be seen. Gestural Abstractionist like Jackson Pollock conveyed their emotions through the intensity of their gestural marks. Krasner offers great insight to the works of gestural abstractionist when she states that while painting it reveals technique, subject, and an insight to another realm. Through their marks, it is clear to identify powerful emotion behind it and gestural art is very successful at displaying the inner thoughts and sentiments of the artist. Gestural work such as Pollock’s compositions enables viewers to enter another world where they can share the artist’s personal feelings. I feel like Krasner is saying that painting with your body and mind impulsively as one and making yourself apart of the painting leads to a more emotional and individual end result. Technique and subject matter are irrelevant as the painting isn’t meant to reproduce an image like a classic portrait or landscape, but invoke a specific emotion from the viewer. There is no specific technique as the paintings convey the raw emotion and feelings of the artist and these cannot be reproduced as something that can be learned. It most definitely explains the styles and methods of Pollock who often made himself apart of his paintings as if he and the painting were one. Recently I was watching a Ted Talk on how to start a movement. In Derek Sivers discussion, he highlights the importance of followership in a leadership context. Sivers states that the first person to follow the leader is far more powerful than many give credit to. The reason behind this credibility is because as soon as a leader has his or her first follower, it instantly authenticates the attempted effort to lead. In this case Peggy Guggenheim and Lee Krasner are far more important than history gives credit to. Art is something that they needed to release. I don’t think the fame, technique, subject mattered to them, they just needed to let it out. The idea of it being therapeutic, a force that can’t be stopped. It reflected the mentally stressful atmosphere around them.